The C-Channel magnetic label holders allow fast and easy updates of product information with instant identification any steel racking, shelving and containers. A full magnet backing ensures extra strength, while the C-Channel allows data cards to be slid into the magnet and display information securely. Since the data cards come in a wide variety of different colors (including white) you can color code scheduling boards and identify files in the office, library or warehouse. The C-Channel of the magnetic label holders allow fast and easy updates of product information with instant identification any steel racking, shelving and containers. The labels are slid into a C-shaped profile together with a protective strip of transparent plastic. Whenever the text on a label needs to be changed or adapted, the old label is simply removed and replaced by a new one. Can be supplied as rolls or as pre-cut pieces complete with paper and protective PVC inserts. Allows quick and easy changes in product identification. This product can be easily cut to size from the roll and then quickly applied and repositioned as required. A card label is inserted into the holder. The whole system is designed to be reused so can be as temporary or permanent as you desire, and is therefore a very economical solution. 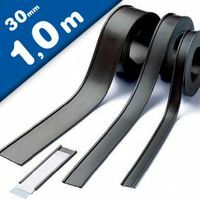 Available in widths from 10mm to 100mm. Easily applied to steel surfaces, often in warehouse stock locations. Who supplies high quality C-Channel Label Holders? Magnosphere offers best priced C-Channel Label Holders globally to all industries, including Automotive, Aerospace, Military, Advertising, Design House, Electronic and Academic/R&D. Please inquire for custom Neodymium magnets or magnetic assembly. Buy C-Channel Label Holders at Magnosphere and get a better deal!